Today, the big boat, Hale Kai, is full so we get chosen to go on Imi Kai, the smaller more agile boat. There are four guest divers, dive master S and boat captain S. We get to do two drift dives today! The first dive starts at a dive site called Outhouse. Yes, there is actually an outhouse built right at the shore, and thus the dive site was called this many years ago. It is a very relaxing dive, not much current so we leisurely kick our way north at about 60 feet below the surface. We discover a leaf scorpion (Yeah B! ), a stocky hawk fish and a huge gathering of assorted fish. Our second drift dive is off the deep mooring at Pyramid Pinnacles and again we drift north. Right away we spy four spotted eagle rays gliding past us but not close enough for photos. It is a dive for invertebrates – shrimp and crabs. 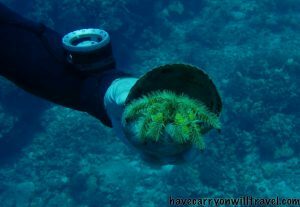 Dive Master S scoops up an orange hairy hermit crab to show us and this fellow is adorable. After yesterday’s dive with the three goof balls, this day’s diving was excellent – calm, unhurried and relaxing. 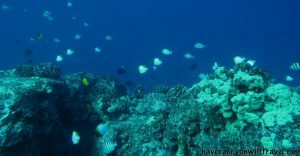 This entry was posted in Hawaiian Islands and tagged Kona, scuba, scuba diving. Bookmark the permalink.